A perfect ending to your experience in Chicago. 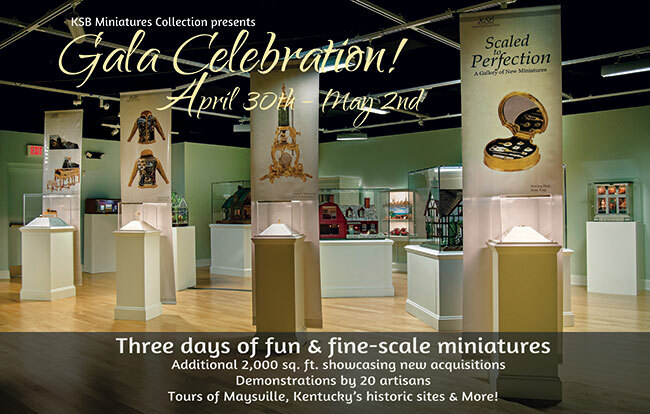 Spend three days in Maysville, Kentucky, exploring the KSB Miniatures Collection’s latest 2,000-square-foot exhibition, Scaled to Perfection: A Gallery of New Miniatures. Enjoy Kaye Browning’s laid-back southern hospitality while touring the charming Ohio River town, neighboring historic sites and a Kentucky horse farm in your free time. Relax with your fine-scale miniatures friends while examining new and never-before-seen works in the galleries and learn from 20 talented miniaturists as they demonstrate their skills. Some meals included. Cost for the three-day event is $150. Doors open at 10 am. Silent auction begins. Artisan demonstrations from 10:30 am to 12:30 pm and 1:30 pm to 3:30 pm. Lunch will be provided. Gala celebration begins at 5:30 pm. Includes heavy hors d'oeuvres and one drink ticket. Cash bar will also be available. Choose from a variety of Maysville locations for dinner (on your own) if desired. Artisan demonstrations from 10:30 am to 12:30 pm and 1:30 pm to 3:30 pm. (lunch on your own). Dinner includes your choice of three entrees from D & D Catering. Dinner begins at 6 pm followed by Kelly Brengelman’s performance Madeline McDowell Breckinridge: Votes for Women! * at 7:30 pm. Cash bar. Complimentary breakfast 9 am to 10 am. Cash bar for mimosas and Bloody Marys. Silent Auction winners will be announced at 11 am. Gala concludes at noon. Tours on your own following closing. Sign-up sheets will be at the opening registration. Mailing and payment information on form. *This program was funded in part by Kentucky Humanities and the National Endowment for the Humanities. The KSB Miniatures Collection is celebrating ten years with an exciting eight-month-long exhibition featuring hundreds of newly acquired miniatures. The exposition will highlight some of the most extraordinary examples of fine-scale art to come available in years. Work from legendary artisans of the past and present will be represented, as well as pieces from talented new artisans, displayed on 43 freestanding lit pedestals and in houses and wall cases. Work includes items from every category including textiles, porcelain, fine-art reproductions and precious metals. In addition, several structures—old and new—will debut along with outstanding pieces purchased from the Miniature Masterworks show in Kansas City. Never-before-displayed pieces by Noel and Pat Thomas include The Whittier, a craftsman bungalow once owned by collector Sarah Salisbury and Megler Landing, an elaborately detailed Victorian. The historic Paul Revere House, Folly Cove and Davidson Shop in Williamsburg by the late Pam Throop, as well as Stonewood Cottage by Ron and April Gill, will also debut along with a distinguished law office by Ashby & Jedd and A Tribute to Browning Manufacturing by Bill Robertson. Maysville is a six-hour drive from the Chicago Marriot O’Hare.